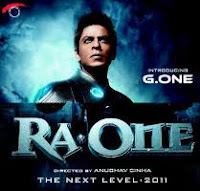 Words on Wings: Watching Ra.One - The much awaited (and bland) movie! Watching Ra.One - The much awaited (and bland) movie! The happenings start when videogame developer Shankar wants to impress his son Prateek with a new game featuring a villain so powerful that he’s almost unbeatable. It all goes wrong when this imaginary villain, Ra.One, empowered by artificial intelligence, actually comes to reality and swears to destroy the 1st player who tried the game, which happens to be Prateek (under the gaming name Lucifer). Ra.One ends up killing Shankar and a lot more innocent people in his hunt for Lucifer. The only solution the developers could think of was to bring G.One, the “Good One” (hero of the game) to life as well. One point to note is that, both these superheroes are provided with a ‘HART’ (Hertz Advanced Resonance Transmitter) to keep them going. And they cannot be destroyed unless they’re killed with this ‘HART’ connected to their body. So in the end, we see G.One and Prateek, hand in hand, defeating the very powerful Ra.One and saving themselves and the world from destruction. The storyline can be described in just 3 words – Virtual Reality Torture. Common people would have a tough time following all that. But yeah, with the researches in the field of Artificial Intelligence going so fast and strong, something like this would not be impossible in future. On the technical side, the movie has done extremely well with power-packed visual effects, stints and direction. The soundtrack, including Akon’s celebrated hits ‘Chammak Challo’ and ‘Criminal’, have done their best to make up for the total lack of adrenaline. All in all, what the movie tried to convey was that “Good can always overcome evil, even if the chances are 0.01 percentage, like that of beating Ra.One”. But 2 hrs and 40 mnts was way too much for that!